According to the latest OCC survey, banks in the US have been easing credit standards for home equity loans. Except for the poorly collateralized loans (HLTV), the survey indicates banks are once again becoming increasingly comfortable with this sector. 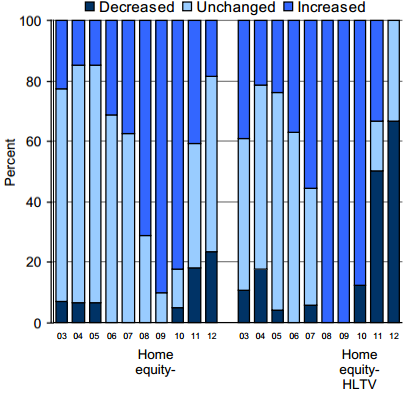 Moreover banks now view their home equity portfolios as less risky. What's surprising is that even the risky HLTV home equity portfolios (loans with "high loan-to-value" ratios) are viewed by banks as posing lower credit risk. The concern over high rates of default for these loans has eased sharply. With these facts in mind, one would think that the holdings of these loans on bank balance sheets should be growing. But the reality is quite different. 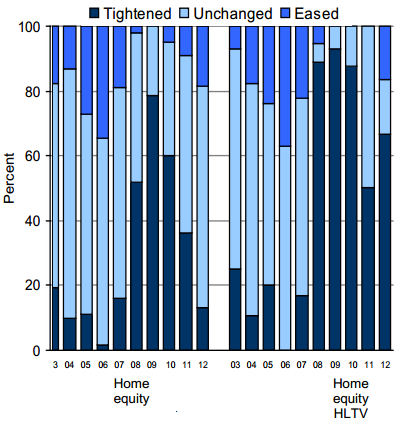 Home equity usage spiked in 2008/09 as consumers tapped revolving credit in fear of losing access to financing. Balances have been declining since. Clearly banks reduced home equity availability in cases where consumers refinanced their primary mortgages (refinancing of first lien mortgages usually required consent from the second lien lenders to make sure they retain their lien status). Balances also came down in cases of foreclosure via write-downs. But as the bank survey shows, a great deal of this reduction has been driven by lower demand from the borrowers rather than tightening credit standards. 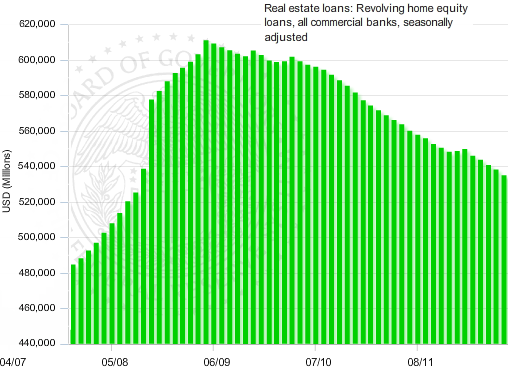 The US consumer deleveraging continues.